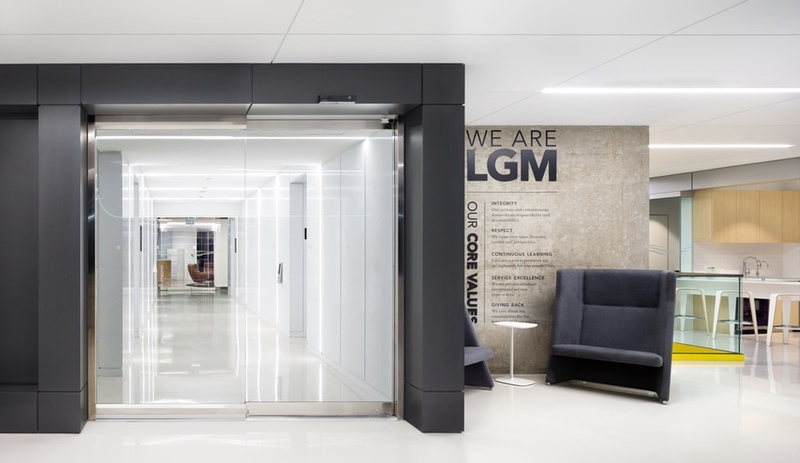 LGM, an automotive warranty and insurance provider, wanted its new headquarters to inspire movement and collaboration. 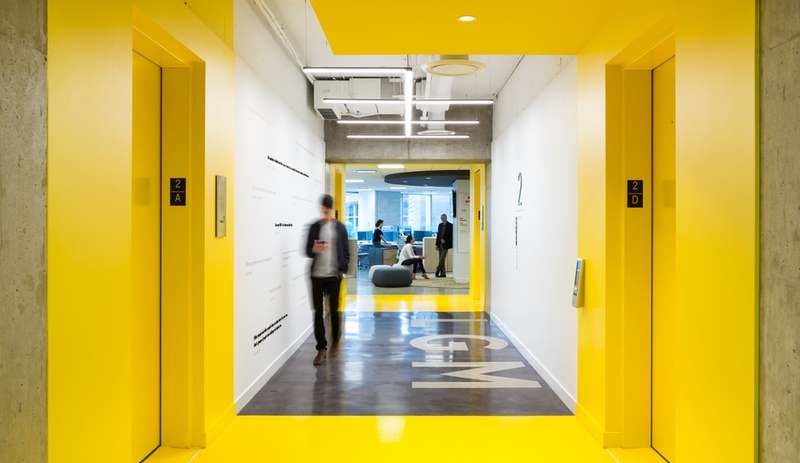 In response, Dialog devised an open, energetic office that revs up the brand story. 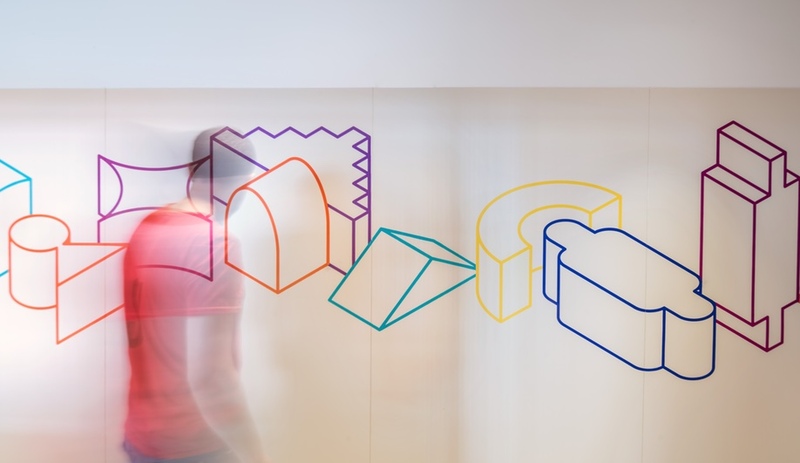 When Dialog, an architecture and design firm known for its thoughtful and sustainable approach to buildings and interiors, was asked to create a headquarters for LGM, the main task was to design an inspiring and playful office that would galvanize employees, encouraging them to move around and interact. But LGM is no regular client – the company provides warranty and insurance solutions to some of the biggest automotive companies in the world. 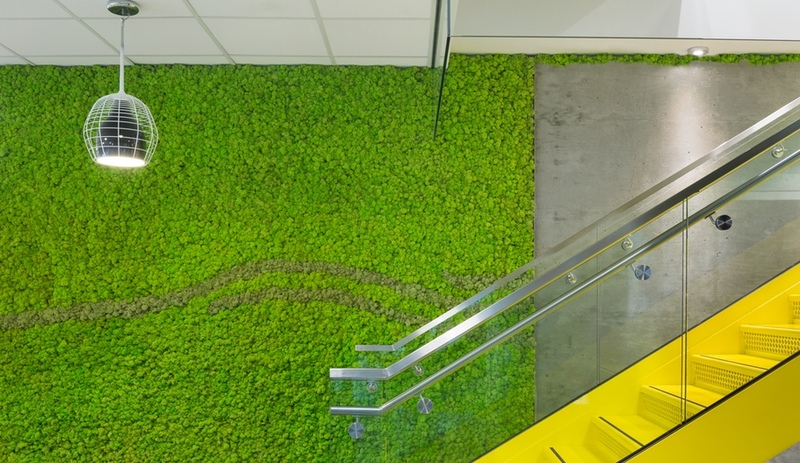 So, Dialog steered the brand narrative in a bold new direction with custom interior features, artwork and signage. The 2,230-square-metre HQ, which just won the Best Tenant Improvement prize from a local real estate award program, is spread out over three floors of Vancouver’s MNP office tower (completed by Kohn Pedersen Fox in 2015). On the fourth and main floor, the reception area, gleaming white with a polished concrete floor and logo-illuminated reception desk, feels sleek yet welcoming. 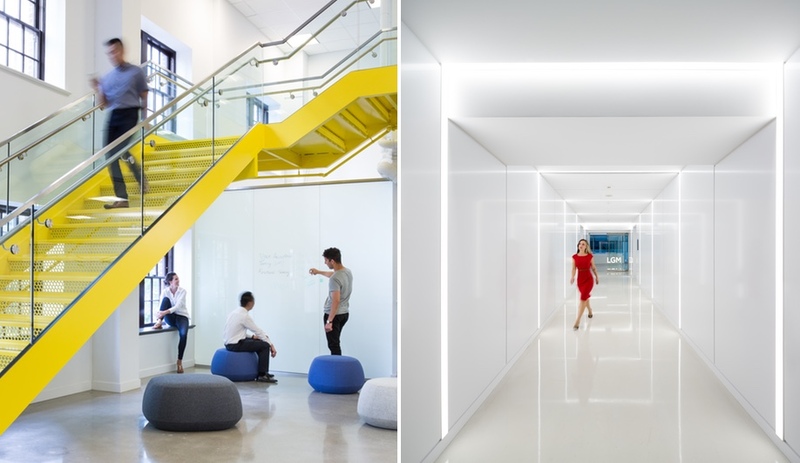 A hallway outlined in lines of light leads to meeting areas on the other end, and the firm’s core values are spelled out in bold type on a wall that also delineates a small breakout zone. 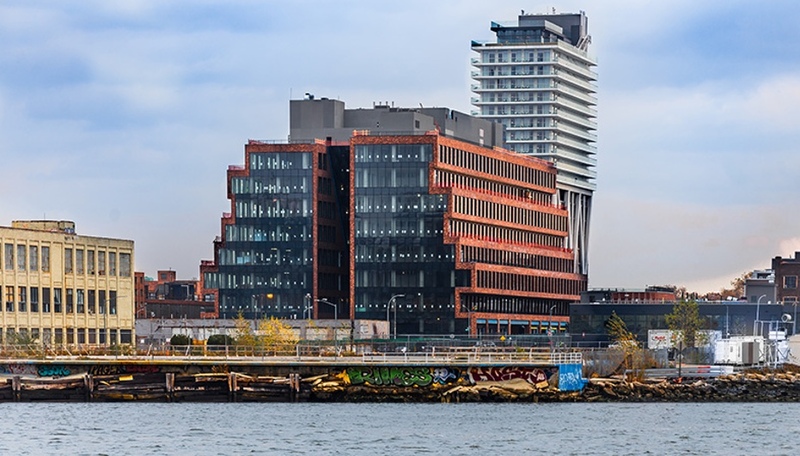 The program of this level sets the tone: like the others, it is a mix of open-concept workspaces, glass-enclosed meeting rooms, collaborative zones and laid-back settings asprawl in trendy pouffes. 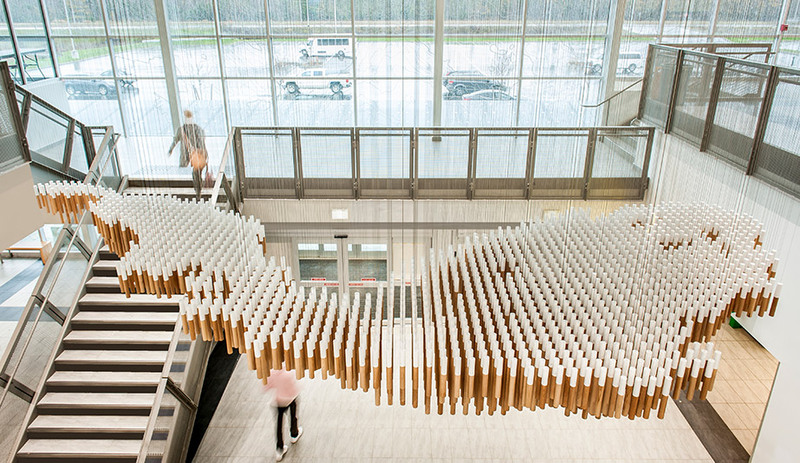 Animating all of the shared spaces are creative features inspired by the automotive industry. Tables feature bases made of refurbished car engines and car wheels, work counters are topped in shattered-glass panels, vintage seat belts provide privacy dividers for meeting spaces, and light fixtures are crafted from standard stick shifts. The coolest arty element is a giant mobile made up of spun aluminum balls that form the outline of a Volkswagen. 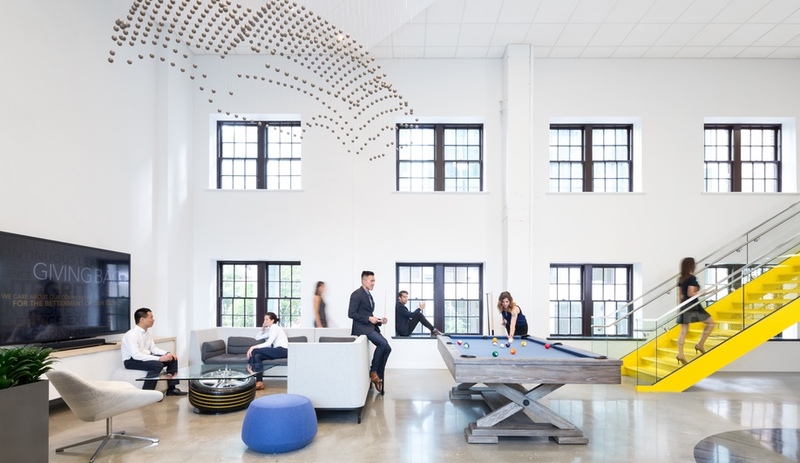 It hangs in a double-height, window-walled gallery that serves as the company’s main eatery, and also includes the requisite pool table. 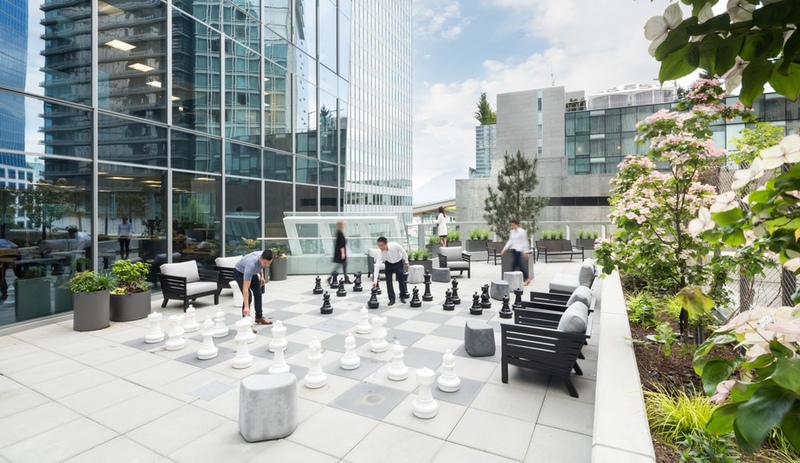 Just outside, a 280-square-metre terrace with a giant chess set and wet bar provides staff with even more creative leisure space. 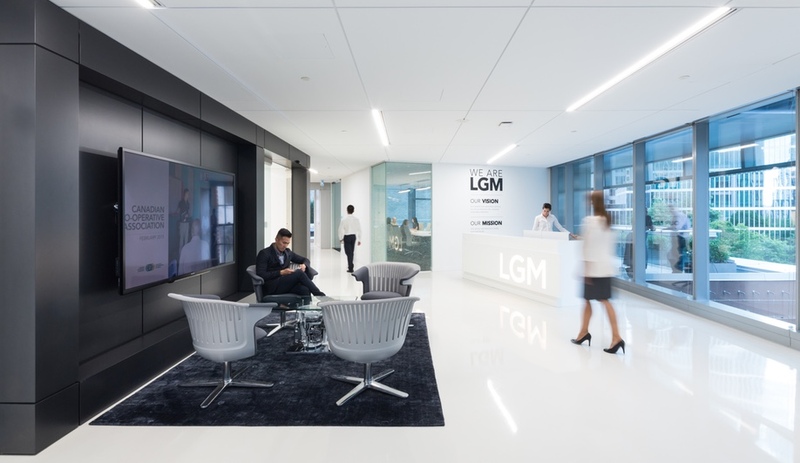 Beyond the repurposing of automotive parts into eye-popping features, the interior plays up LGM’s corporate identity in interesting ways. 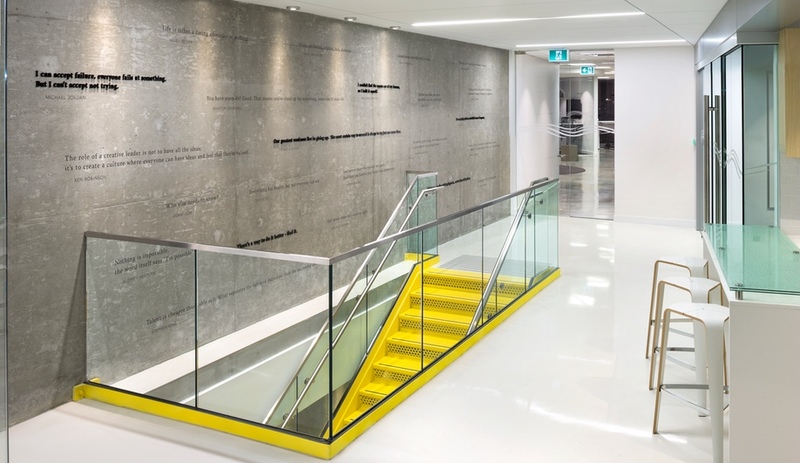 The wayfinding connecting all three floors is done in the company’s corporate colour – a splash of yellow that covers the elevator vestibules, as well as the perforated metal staircases. The designers put the walls to work as well: a plant system, a series of inspirational quotes by prominent figures such as Ferdinand Porsche and Nelson Mandela, writable surfaces and technology screens that allow client interaction with LGM’s products transform rooms and hallways.